This concise pocketbook will provide readers with an overview and background of meningococcal disease, treatment options and emerging therapies, and methods of prevention. 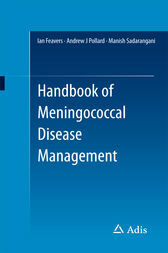 The book was originally commissioned due to recent developments in vaccinations to prevent meningococcal disease. This book reviews the disease progression and associated risk factors; its pathogenesis and diagnosis; methods of treatment and prevention, both current and emerging; and the future directions of meningococcal disease management. The book is ideal for busy healthcare professionals, as it covers all aspects of the disease and its treatment in a condensed and manageable format, whilst including the most up-to-date treatment guidelines and algorithms. Ian Feavers, PhD, is Head of Bacteriology at the National Institute for Biological Standards and Control (NIBSC), UK. He received his PhD from the University of Newcastle upon Tyne. After graduating he undertook postdoctoral research in molecular genetics at the University of Sheffield and the Friedrich Miescher Institut in Basel. During the late 1990s, when new conjugate vaccines were being introduced, he headed the laboratory responsible for the control and standardization of meningococcal and pneumococcal vaccines. He continues to oversee an active research program on the molecular genetics and immunology of meningococcal antigens. Because of his broad experience of bacterial vaccines and molecular biology, he has been closely involved with a number of meningococcal vaccine developments. He regularly contributes to WHO and EU guidelines, has been an advisor to the International Vaccine Institute’s typhoid conjugate vaccine initiative, and serves on the Public Health England invasive bacterial diseases forum. He is one of NIBSC’s observers on Joint Vaccination and Immunisation Committee (JCVI) and a member of the JCVI subgroups on meningococcal and pneumococcal vaccines. He is a former editor of the Journal of Applied Microbiology and is currently an associate editor of Human Vaccines and Immunotherapeutics. He has over 100 publications, including peer reviewed research papers. He teaches on vaccine related courses at the University of London, University of Surrey, and is a Visiting Professor at Imperial College. Andrew J Pollard, FRCPCH PhD, is Professor of Paediatric Infection and Immunity at the University of Oxford, Director of the Oxford Vaccine Group, Fellow of St Cross College, and Honorary Consultant Paediatrician at the Children’s Hospital, Oxford, UK. He obtained his medical degree at St Bartholomew’s Hospital Medical School, University of London in 1989 and trained in Paediatrics at Birmingham Children’s Hospital, UK, specializing in Paediatric Infectious Diseases at St Mary’s Hospital, London, UK and at British Columbia Children’s Hospital, Vancouver, Canada. He obtained his PhD at St Mary’s Hospital, London, UK in 1999 studying immunity to Neisseria meningitidis in children and proceeded to work on anti-bacterial innate immune responses in children in Canada before returning to his current position at the University of Oxford, UK in 2001. He chaired the UK’s NICE meningitis guidelines development group, the NICE topic expert group developing quality standards for management of meningitis and meningococcal septicemia. He chairs the UK Department of Health’s Joint Committee on Vaccination and Immunisation and the European Medicines Agency scientific advisory group on vaccines. His research includes the design, development and clinical evaluation of vaccines; including those for meningococcal disease and enteric fever and leads studies using a human challenge model of (para)typhoid. He also runs surveillance for invasive bacterial diseases and studies the impact of pneumococcal vaccines in children in Nepal. He has supervised 23 PhD students and his publications include over 300 manuscripts and books on various topics in pediatrics and infectious diseases. Manish Sadarangani, MRCPCH, DPhil, is a Clinical Lecturer and Honorary Consultant in Paediatric Infectious Diseases and Immunology at The Children’s Hospital, Oxford, UK. He completed his DPhil with the Oxford Vaccine Group in 2011, studying Opa proteins as a potential novel vaccine candidate for protection against capsular group B meningococcal disease, and completed a Fellowship in Paediatric Infectious Diseases in Vancouver, Canada in 2013. Current research interests include meningococcal disease, in particular the development of new meningococcal vaccines, childhood meningitis and encephalitis, the influence of the human microbiome on allergic and infectious disease, and antimicrobial stewardship.